Few things are more intriguing than some of the out-of-this-world patterns one encounters under the water. 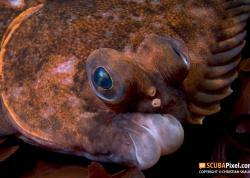 Here are some tips to capture mesmerizing underwater graphics. 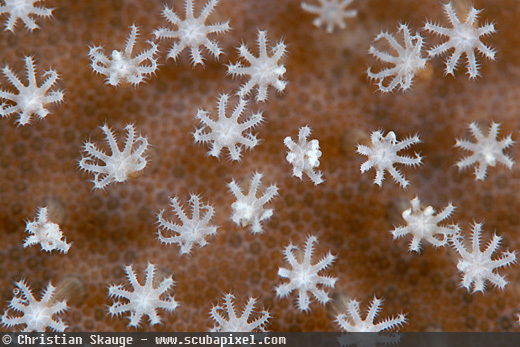 Patterns can be found almost anywhere under water - in hard or soft coral, fish, mussels and other invertebrate animals. If you look closely, you’ll find some kind of pattern in more things than you’d think. Still, it takes a little more than “point and shoot” before you’re able to translate what you see into a great image. 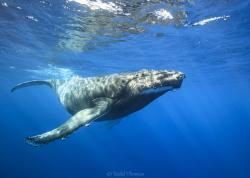 As with any kind of underwater images, first you need to find what you want to photograph. 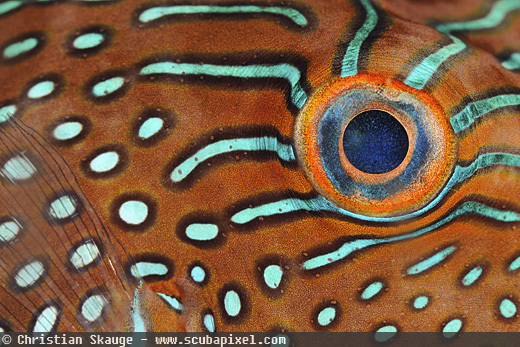 I often find beautiful patterns in fish, especially around the eyes or in the scales themselves. Parrotfish is a dead giveaway when talking about fish patterns, but many other species are worth a closer look too. To really capture the pattern and let it speak for itself, you need to capture just the pattern and nothing else. Filling the frame is the mantra here: Half a fish doesn’t really cut it, no matter how intricate and beautiful its pattern is – it’s still just half a fish. There is one very simple way to achieve this: Get closer. It’s only when the pattern completely fills the frame that you really see it for what it is – a thing of beauty in itself. Fish provide an endless source of beautiful patterns, but most of them are notoriously difficult to approach and photograph. It’s hard to get as close as you need to be able to frame just a part of the fish. There are two solutions to his – focal length and night dives: Most fish sleep during the night, and by careful maneuvering you should be able to get what you want. Enough focal length (more about this later) means you don’t have to be almost touching the fish when taking your shot. Learn more about filling the frame. 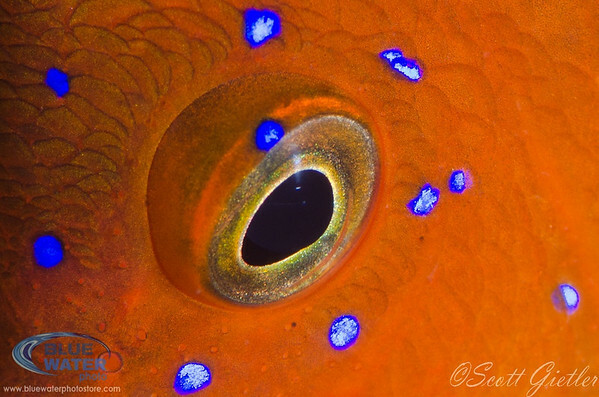 Many fish have beautiful and colorful patterns around the eyes, presumably to make it harder for predators to see which way is forward. Get close enough and you’ll get some very interesting images. 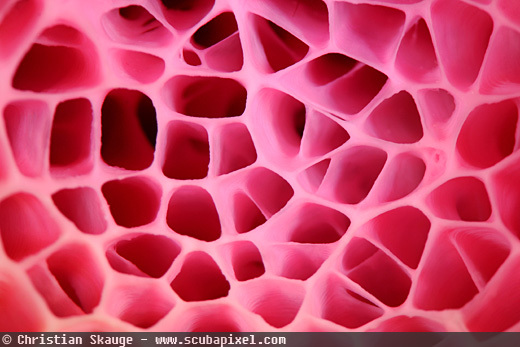 When there’s enough of something and you let it fill the frame, even leather coral polyps form a beautiful pattern. Remember that fish are very sensitive to changes in water pressure. 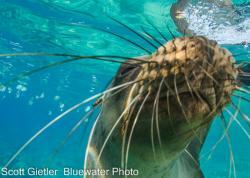 Their fine-tuned lateral line allows them to sense almost anything sneaking up on them, even if they can’t see it. That means you have to be very careful and not push too much water ahead of you in a sudden burst – that will most likely spook any fish, sleeping or not. Another thing to consider about sleeping fish is that disturbing them leaves them vulnerable to attack and injury. This is especially important when it comes to parrotfish: When they go to sleep they produce a “sleeping bag” made of mucus, designed to protect them from predators. When spooked, they leave it behind and have to do it all over again. 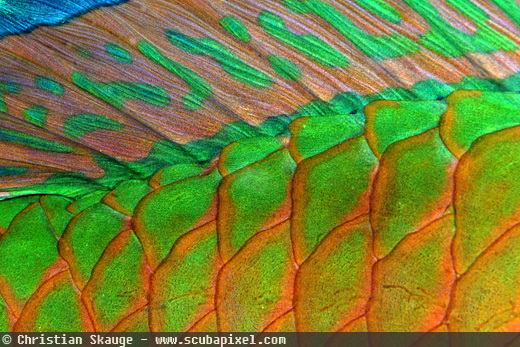 Parrotfish provide an endless source of colorful patterns, provided you can get close enough. Coral fans give you the opportunity to capture sort of a pattern against a black background. The back of the pectoral fins are stunningly beautiful on many scorpionfish, but it might be very hard to capture it “on film”. This lionfish was sleeping, which made it a whole lot easier. Echinoderms are another rich source of patterns. To me, sea urchins are more interesting dead than alive, because the spines get in the way of their intricate shells. 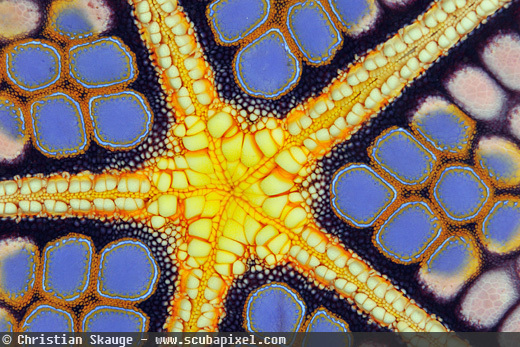 Looking closely at starfish and sea cucumbers is usually much more rewarding: Some species have their entire bodies decorated by beautiful patterns. All you have to do is to find a suitable crop, as these animals will let you shoot on forever without running away. If you’re lucky (meaning look closely) you often find minute crabs and shrimp living on these animals too – and this may add a little something extra to your image besides the pattern. If you’re able to combine two things, your image will benefit greatly. When you carefully flip a starfish on its back, you often get a pleasant surprise: Some of them have the most incredible patterns underneath, especially around the mouth. It’s a bit controversial to touch your subjects, but if you’re careful no harm will come to the animal. Observe the starfish before you do anything to make sure it’s not feeding – if it moves it should be okay. After getting your shot make sure you turn the co-operative fellow back on its right side in the exact spot you found it before you leave. Some starfish make your jaw drop when you turn them gently over. 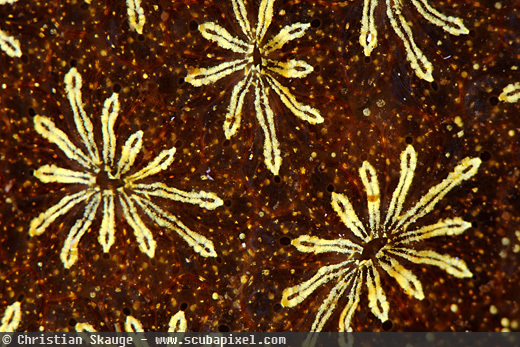 This species, found in Lembeh Strait, has patterns all over. Sea cucumbers are always interesting, and show off many different types of patterns and even textures. Close up this one looks almost like elephant skin, apart from the yellow spikes. 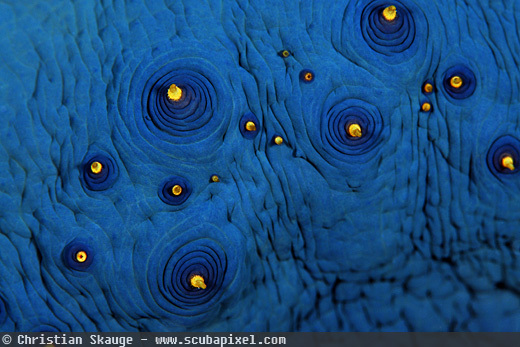 Even ascidians (sea squirts) can display beautiful patterns. The closer you look, there more you’ll find! 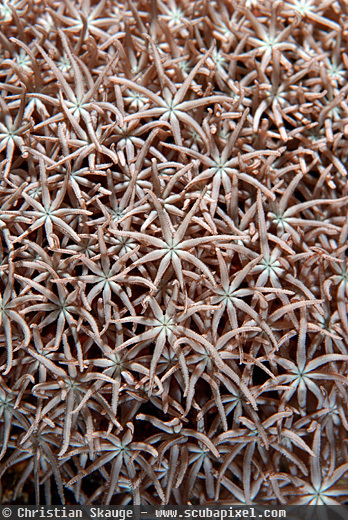 Coral provide plenty of opportunities in terms of patterns. By design many of them are just a bunch of repeating structures! By carefully searching and selecting your frame or crop, it’s pretty easy to produce some eye-catching images. 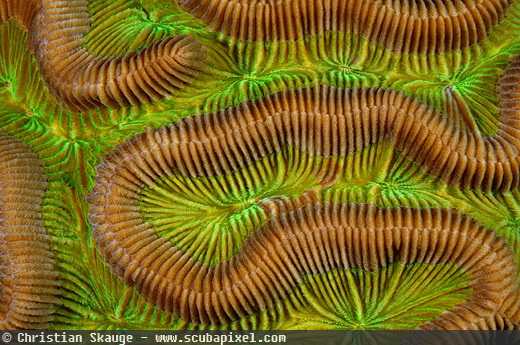 Brain and star coral are obvious choices, but many other species have cool patterns too. 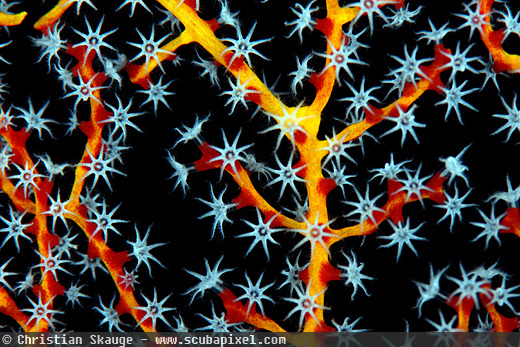 Even soft coral can sometimes have breathtaking patterns, especially on their stems. They are also a good place to find little fish and crustaceans, so checking them carefully may pay off in more ways than one. Coral fans are also a good place to look. They can be almost lace-like in their structure, and have the added benefit of letting you shoot them with a black background. This can provide an interesting change for images which are all filled with color and pattern. 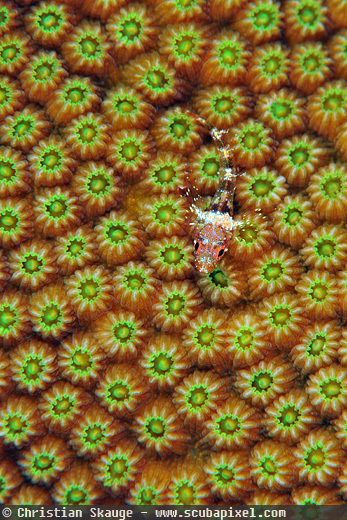 A nice, uniform coral pattern becomes even more interesting when there’s a little fish sitting on it. Play with depth of field to create interesting effects. When capturing patterns I often find it best to shoot at a 90 degree angle. Most of the time I choose “flat” light – in effect the same strobe output on both sides. This hides most of the surface texture, letting the colors and patterns stand out in their own right. If you use different strobe power on one side, you will instead make the texture stand out more. This can also produce some very nice images, and I really encourage you to try shooting with different techniques – but for patterns, flat light does the trick best in my book. Playing with depth of field can also produce some nice effects, but here too you will quickly find yourself drifting away from shooting actual patterns into something else. I often shoot with as high an F-stop as I can to iron out any out-of-focus areas in the image, which to me often ruins the pattern. A fast shutter is, as always, a good idea. Pattern or texture? Subtle changes in strobe output can make it go either way. In most cases, shooting patterns is macro job. Which lens you choose depends on the size of your subject, but most of the time we’re talking small stuff here so a 100/105 mm will be a good choice – maybe even with a teleconverter on top. In theory, a 60 mm lens will produce the same image as the 100/105 mm (they’re both 1:1), but you will have to get a lot closer than you need to with a longer lens. I often find that when I get too close I run into trouble with the light: It comes too much from the sides, producing more of a texture than a pattern. This is why I love the 105 mm for my pattern jobs. When trying to capture fish details you’ll definitely appreciate the working distance offered by a 100/105 mm lens – unless we’re talking about the lovely pattern found on the back of a whale shark. In the end it’s not extremely difficult to shoot patterns. You don’t need to be a star photographer to get some good results – being good at spotting subjects is at least as important as mastering the subtleties of your camera. Happy shooting! 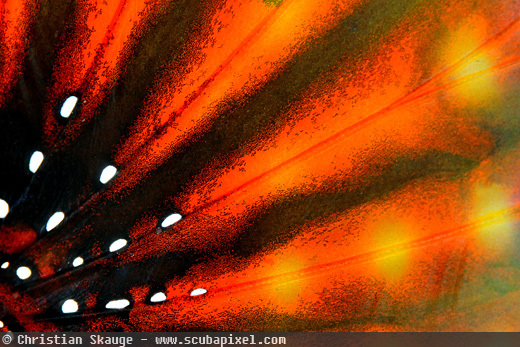 Christian Skauge is a former Nordic Champion of underwater photography and has won several international photo contests. 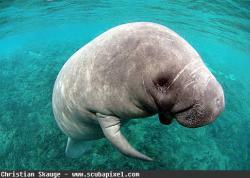 He writes articles about diving and underwater photography and is published regularly in magazines around the world. 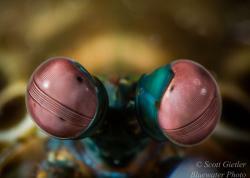 He also runs underwater photo and marine biology workshops. Check out his website for more info: www.scubapixel.com.